A fire Thursday night damaged the S.W. Bowne Grain Storehouse, a vacant warehouse on the Gowanus Canal’s shoreline that community activists say should be landmarked. The fire started at approximately 11:15 p.m. on the top two levels of the vacant four-story Red Hook warehouse. An FDNY spokesperson told the Brooklyn Eagle that 25 units and more than 106 firefighters responded to the scene and had the fire under control by 12:37 a.m. The cause of the fire is under investigation by fire marshals. The two-alarm blaze at 595 Smith St. was fought from the Gowanus Canal by fireboats Marine 6 and Marine 9 and from land by firefighters from the Ladder 131 Engine 279 firehouse located around the corner from the burning building, a source told the Eagle. Damage to the roof and the top of the warehouse’s wall was visible on Friday from the nearby Hamilton Avenue Bridge. The air in the vicinity of the building smelled like burned wood. On Friday, a member of the FDNY told the Eagle that the fire department was waiting for the city Buildings Department to make a determination about the burnt warehouse’s stability. In the meantime, firefighters and fire trucks maintained a watch line on Smith Street, meaning they stood at the ready in case the grain storehouse collapsed or another fire broke out. At that point late Friday morning,the FDNY had not been able to search the building for possible squatters, the FDNY member told the Eagle. The S.W. Bowne Grain Storehouse was constructed in 1886. It belongs to the Chetrit Group through two limited liability companies, city Finance Department records show. The Manhattan-based real estate firm purchased the warehouse as part of a package of four properties for $14.5 million in 2007, the records indicate. Executives at the Chetrit Group did not respond to the Eagle’s request for comment about the fire in time for deadline. Last September, the property owner filed a Buildings Department application for a permit to demolish the entire building. In recent weeks, witnesses saw workers removing pieces of the warehouse’s roof. The fire took place the day after the office of City Councilmember Carlos Menchaca (D-Red Hook) reached out to the landlord to discuss complaints about conditions on the property, including illegal dumping, decrepit sidewalk sheds and unpermitted construction and demolition. The councilmember and his staff were in consultation with FDNY, Red Hook community leaders, the Buildings Department and other agencies on Friday. He called on the city to pull out all the stops in its investigation. “While I’m reassured that there is an active fire investigation, I also call for full public disclosure of its findings about the cause of the fire,” Menchaca said in a statement. 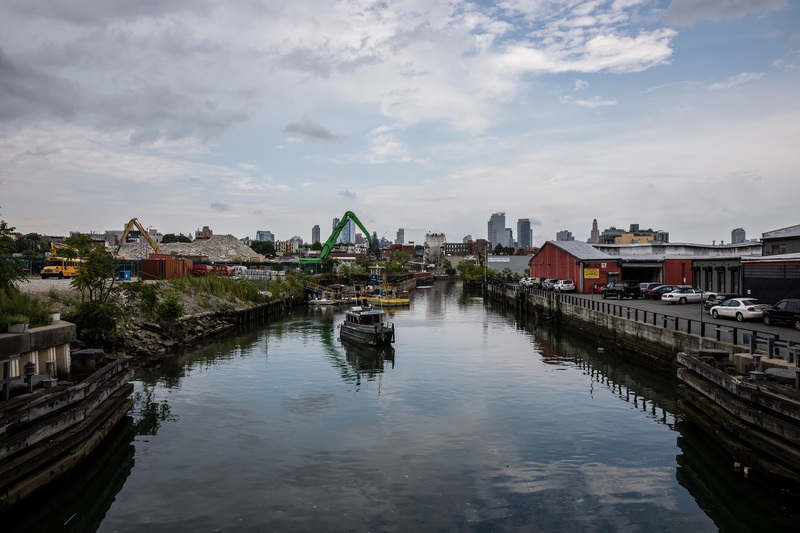 The Gowanus Landmarking Coalition, which consists of seven community groups, included the grain storehouse on its list of 33 proposed Gowanus and Red Hook landmarks last year during the city’s Gowanus Places study. The coalition sent a second formal request for landmark evaluation to the city Landmarks Preservation Commission in recent weeks when work began on the warehouse’s roof. “I, along with the other members of the Gowanus Landmarking Coalition, are shocked and outraged at the news of the fire at the S.W. Bowne warehouse,” Peter Bray, chairman of the Park Slope Civic Council’s Historic District Committee, told the Eagle on Friday. “The fire is highly unlikely to be mere coincidence, since it occurred one day after the owner was contacted by Councilmember Menchaca’s office to inquire into recent demolition work being performed on the building and notified of our interest in preserving the building,” Bray said. “We are calling upon the proper governmental authorities and the Fire Department to undertake an intensive investigation into the cause of the fire, and if it is determined to be arson, to bring the full weight of the law upon those responsible for this act of wanton and illegal destruction,” Bray added. A source told the Eagle that FDNY is looking into the history of permits on the site and into recent demolition activity. The source spotted an FDNY drone flying over the warehouse Friday morning to take photos. Artist Ken Rush was appalled by the condition of the Bowne building when he arrived at the Hamilton Avenue Bridge on Friday morning to paint a picture of the historic property. “It looked dangerous before the fire. It looks treacherous now,” Rush told the Eagle. Another painter, Nicholas Evans-Cato, took a camera to the Hamilton Avenue Bridge on Friday and aimed it at the warehouse. “I came to take pictures of it before, I fear, it’s going to disappear,” Evans-Cato told the Eagle.